HIDWtS: Don’t be that guy. Some days I have a clear picture of what is right and what is wrong. Per yesterday’s post, there are unspoken rules that are pretty obvious. When they occur, passengers are fazed, or are at least slightly less apathetic than usual. Other days, I am just not sure. There is one Muni seating situation that never fails to throw me because it seems wrong yet fazes no one but me: Blockit No Pocket. You know how much I love sitting in The Pocket. As much as I love that, other people love sitting in the Blockit without anyone sitting in The Pocket. In general, I do not understand the habit of sitting in the aisle seat to block off the window seat. It’s not like I can’t see the empty seat next to you. Worse than this is when I attempt to sit in the window seat and the aisle-sitter does not get up, but merely twists aislewards so I can attempt to smush past or climb over. Don’t be that guy. I mean that with love and compassion and gender neutrality. Don’t make your preference — which is everyone’s preference, by the way, not to sit next to a stranger who might poop on you — anyone else’s problem. Just sit like a responsible adult, out of the way of other people. And get off the phone! HIDWtS Rating: Yes, I am bossy today. People sit in the aisle seat and leave the window seat open on our Skytrain too. I really don’t understand it. It drives me crazy! It makes me wonder if people think that by doing that, no one else will sit in the window seat, leaving them the whole seat to themselves, or something like that. Not going to happen! 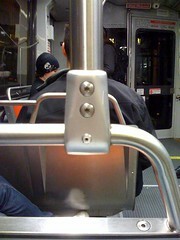 I am sad this happens there too, as I had hoped it was an artifact of San Francisco’s generally lax social etiquette.